Meet the Friendly Ghosts: Casper, Phantom, Slimer and Wraith. This summer’s “Ghost Busters” movie was about naughty ghosts getting busted, but we’re going to discuss some very friendly and helpful “ghosts” who do some busting of their own: they bust (or detect) visual regression bugs on your website. A visual regression bug is a style defect that is unintentionally introduced to the site, usually when a well-meaning developer changes some other styles. Unless you test every page (and every resolution) of the site every time you make a style change, these regression bugs can go unnoticed and get deployed to your live website. Conducting this much manual testing on regular basis would be quite costly. It would also not be very reliable because humans often overlook slight variations in typography and layout. This entry was posted in Learning Resources, Testing on November 3, 2016 by abonham2012. If you need to see my html markup to parse this, let me know in a comment. My markup is the standard accordion.js structure so I think this will make sense to many of you without the markup. This entry was posted in CSS, jQuery and tagged jquery on February 25, 2014 by abonham2012. 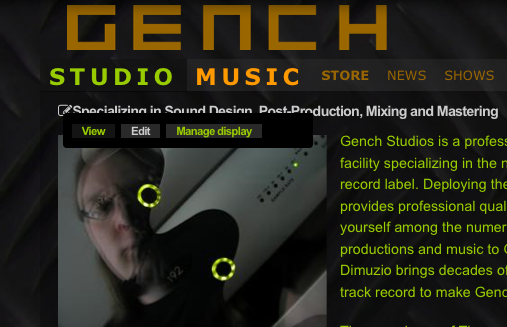 I finally launched the new and improved gench site! It’s my first Drupal site. In order to replace the current (non-drupal) site with the new one, I had to juggle some big directories around on the live server. The good news is it’s relatively easy to do this. The bad news is it’s still rather nerve-racking! UNIX commands are indispensable for a task like this. This entry was posted in Site Building on October 15, 2013 by abonham2012.